Home > Uncategorized > Oregon Presentations! We’re doing a few presentations before we actually push off. The first one will be THIS Friday at our favorite bike shop, Clever Cycles. We’ll be talking about our previous 15-month journey, as well as our next trip using Bromptons and trains, and our vision of redefining the All-American road trip. We have a Facebook Event page for the presentation at Clever and urge you to RSVP so we can figure out how many chairs to commandeer. 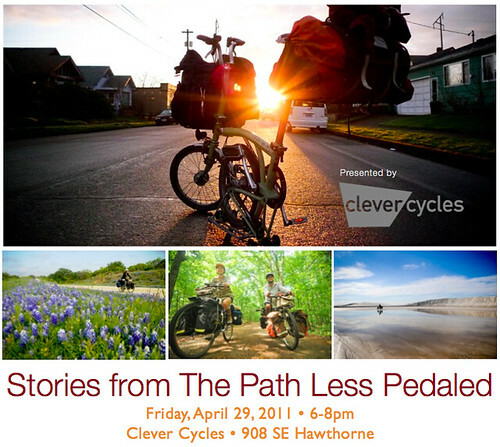 Below are the Clever Cycles Presentation details. We’ll have the Bromptons there, fully-loaded, so you can check out how we’ve packed and what we’re carrying. 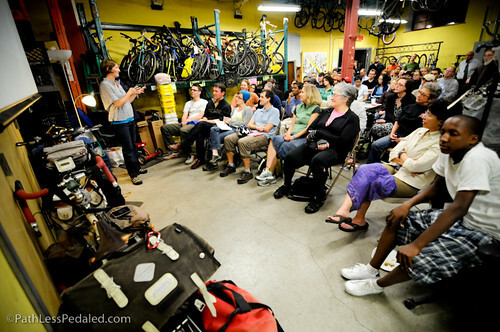 On Thursday, May 5th, we’ll be giving another presentation in Laura’s hometown, Corvallis, OR! If you’re in the nearby towns of Salem, Albany or Eugene, it would be great to see you! Here’s the link to the Corvallis Facebook Event page. @Ladia great idea, we’ve tried a few times but the audio always seems to come out horribly. Hopefully one of these days we’ll be able to coax someone into filming it! My nokia phone has handsfree set capable to make direct audio of my voice in reasonable quality. Try to record voice separately from pictures and then put it together in cutting proces. For synchro use some kind of clapperboard. Corvallis is your hometown. Awesome. Go Beavs!!! !